This prestigious group is comprised of area Italian Americans who have made significant contributions to the community. These men and women have shown a tremendous amount of dedication and leadership. Inductees are nominated by the community and selected by the Hall of Fame and Special Recognition Committee annually. Nominees should be persons of Italian heritage whose exemplary lives have made significant contributions to the community in the arts, sciences, government, business, industry, education, volunteer, civic and philanthropic activities, or any other category that is appropriate. Such contributions should reflect a notable community impact and highest standards and ideals. The primary difference between Hall of Fame and Special Recognition consideration is whether the nominee has significantly impacted the Italian American community. Hall of Fame nominees should be individuals who have made an overall positive impact in the Italian American community. 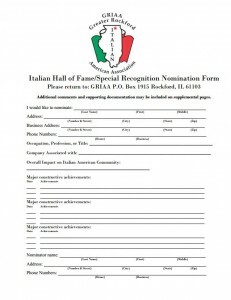 Nominees who have not significantly impacted the Italian American community but otherwise meet the criteria mentioned above will be considered by the committee for Special Recognition honors. It is not necessary to indicate on the nomination form which category you are nominating the individual for. The committee will make that determination based on the information provided. If you have any questions, please use the contact form below. Frank Perrecone, president of the Greater Rockford Italian American Association carrying the Columbus stemma banner at the Columbus Day Mass procession in St. Anthony of Padua Church. Paul Mastrangli following carrying the Columbus wreath to be placed at the monument in the church gardens. Presentation by Frank Perrecone at the Columbus monument in the St. Anthony Church gardens. Next to Frank is Whiety Marinelli, Ben Todaro and the Amici Italiani Dance Troups.